PRowl Public Relations had their contract renewed with long-term client Temple University Television (TUTV) in the summer of 2014. Our firm served as the public relations consultant for TUTV from August 2014 to May 2015. The account staff assisted in executing the TUTV Most Spirited Contest throughout the course of the Fall 2014 semester. This contest was designed to showcase Temple University students’ school spirit. The contest acquired submissions through TUTV’s newly launched Instagram account. The PRowl Public Relations account drafted a pitch and sent it to seven account holders of university-affiliated Twitter accounts that the TUTV account had pitched to in previous years. The pitch asked each of the accounts to tweet about the event and assist in promoting Most Spirited to their followers. Tweets were also sent through the TUTV Twitter account promoting the Most Spirited event, contest dates, and the prize. In addition to social media promotions, the PRowl account team created a flyer to promote the Most Spirited contest and saw it distributed to students on campus at the Bell Tower, as well as posted on the bulletin board inside the campus coffee shop, Saxby’s. 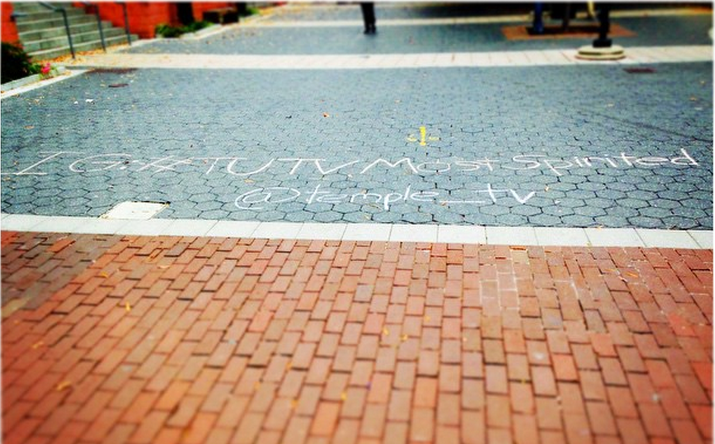 #MostSpirited was written directly on the sidewalk in high traffic areas on campus, such as outside the Howard Gittis Student Center, at the Bell Tower, and on Liacouras Walk. This provided visibility to students and attempted to increase awareness of the contest. The TUTV Most Spirited contest resulted in the @temple_tv Instagram account generating 130 followers in the span of two weeks, with an increase during the second week. It was estimated the promotion efforts reached about 2,000 out of 37,000 Temple University students.